Introduction: Children have non specific symptoms after mild head injury (MHI). It is difficult to define indication of CT scan among them. We aimed at identification of predictors of CT scan findings after MHI. Materials and Methods: Children aged ≤12 years with GCS 13-15 after head injury were retrospectively evaluated for their clinical and CT scan findings during January to March 2010. The variables used for detection of abnormal (positive) CT scan were age, gender, cause of injury (road traffic accident, fall, and assault), loss of consciousness, vomiting, ear or nose bleed, seizure, and GCS score. Results: A total of 133 children were included in study. Sixty nine (51.9%) children had abnormal CT findings. There was no statistical difference in patients with normal vs abnormal CT scan for presence of any of the variables evaluated. Conclusion: An abnormal CT scan cannot be reliably ruled out in a child with MHI based on symptoms; hence a policy of liberal CT scan based on clinical acumen is advisable. Adrenoleukodystrophy (ALD) is a genetic disease associated with demyelination of the central nervous system, adrenal insufficiency, and accumulation of very long-chain fatty acids in tissue and body fluids. 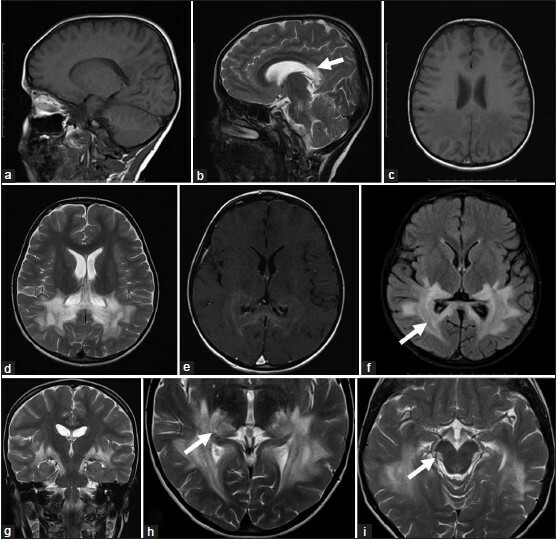 The attempt of this paper is to review the classical and not-so-classical MR imaging manifestations of adrenoleukodystrophy. A review of literature is done to describe the pathophysiology of the disease and the imaging differences between childhood and adult-onset of the disease. The literature is reviewed to explain the link with Addison's disease. In consensus the magnetic resonance imaging (MRI) findings of symmetrical occipital white matter lesions which progress in a rostro-caudal direction is the classical appearance of ALD. Familiarity with the clinico-pathologic manifestations and progressive MR imaging features of childhood cerebral X-linked ALD will be helpful in evaluating the affected patients. Intramedullary spinal cord abscess in children is rare and holocord abscess is rarer. 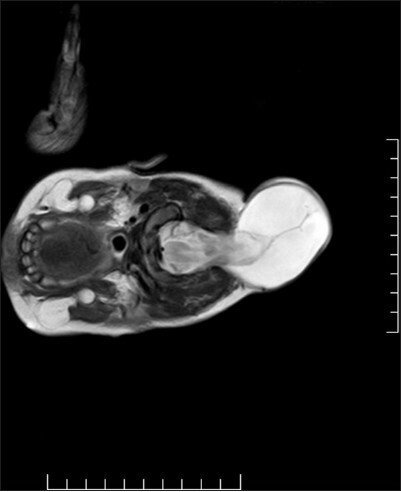 An 18-month-old girl presented with rapidly progressive paraplegia with fever for 2 months. 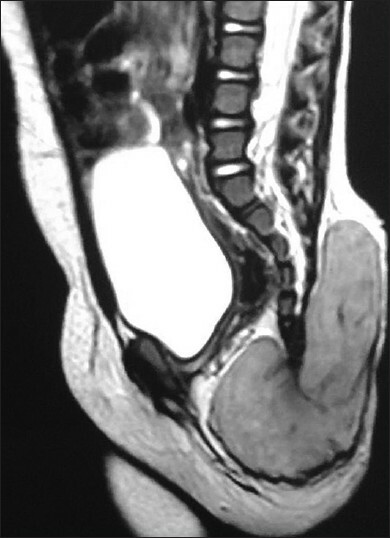 The patient had complete flaccid paraplegia with absent sensation below D4 level. There was very small dermal sinus discharging pus in the lower lumbar region. 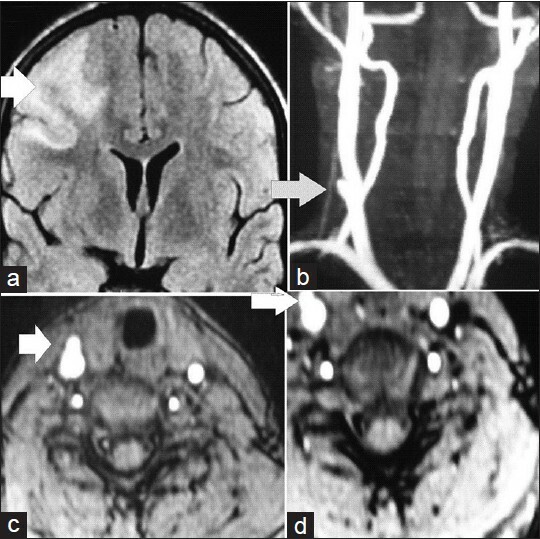 Magnetic resonance imaging showed evidence of extensive multiloculated intramedullary abscess extending from D4 to L5 with cord edema upto cervical level. Laminotomy, excision of the dermal sinus and myelotomy, and evacuation of intramedullary abscess was performed. Escherichia coli and Pseudomonas were grown on culture. 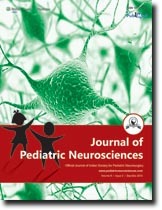 The child was treated with long-term parenteral antibiotics and started showing neurological improvement. 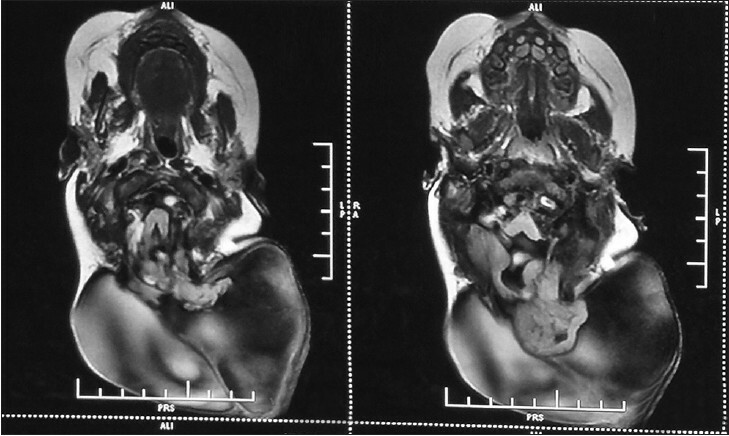 Holocord abscess secondary to congenital dermal sinus is extremely rare and this is only the fourth report of such an instance. 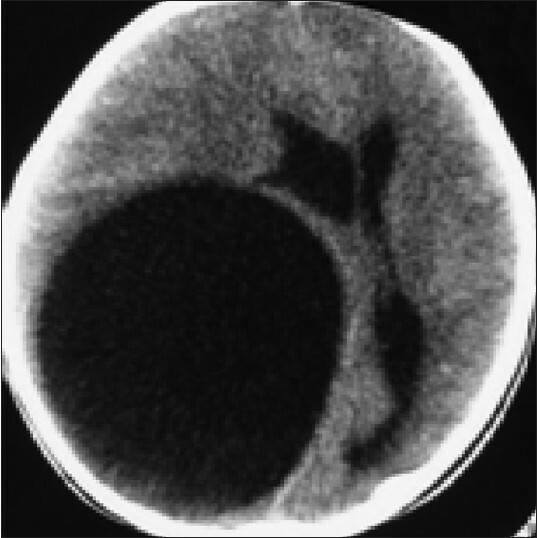 The presence of torcula or sinus in the occipital encephalocele presents a challenge during surgery. However, a detailed study of magnetic resonance image and magnetic resonance venography can aid in preoperative localization of the torcula. Knowing the encephalocele's contents, its relationship with falx cerebri and falx cerebelli, and vigilance during surgery is a sure way to protect neural tissue. Visual Evoked Potential (VEP) may be indicated in torcular encephalocele. Here, authors report two such cases, one presented with ruptured encephalocele with cerebrospinal fluid leak and another case presented six months after birth due to financial constraints. Pertinent literature and management is briefly reviewed. Moebius syndrome is a rare congenital neurological disorder. The most frequent mode of presentation is facial diplegia with bilateral lateral rectus palsy, but there are variations. 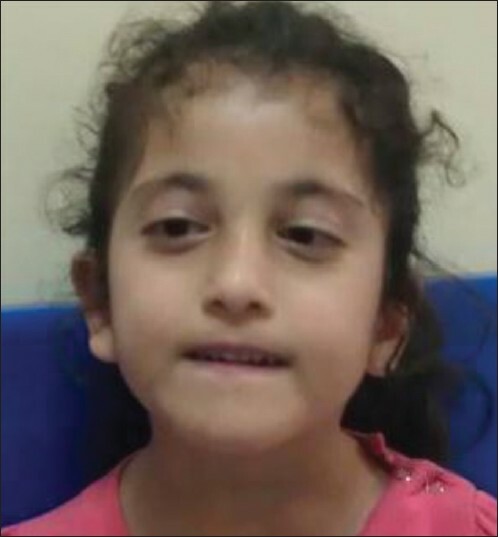 Here, we report a rare case of Moebius syndrome in a 15-month-old child with unilateral facial palsy, bilateral abducens nerve palsy with Dandy Walker variant, and complete agenesis of corpus callosum. Angelman syndrome (AS) is a neurogenetic disorder that usually presents with delayed motor milestones, ataxic gait, mental retardation, language disorder, seizures, sleep disturbances, characteristic facial features, and happy demeanor. The genetic abnormality of AS has been located on chromosome 15q11-q13. The AS gene(s) is exclusively expressed from the maternal chromosome. Loss of the maternally contributed AS region can occur by deletion, paternal uniparental disomy, imprinting defects, mutation of the ubiquitin-protein ligase (UBE3A) gene, and by yet unidentified mechanisms. Deletion of maternal chromosome accounts for most of the cases of AS with imprinting accounting for 2%-5% of cases. In imprinting inheritance, offsprings of carrier mothers are theoretically at 50% risk of having AS. Familial occurrence of AS has been reported. Here, we highlighted the rare incident of AS in three biological siblings and their neuropsychiatric manifestations as well as different psychosocial aspects. Rathke's cleft cyst (RCC) are benign, epithelium-lined sellar and suprasellar cysts believed to originate from remnants of the Rathke pouch. 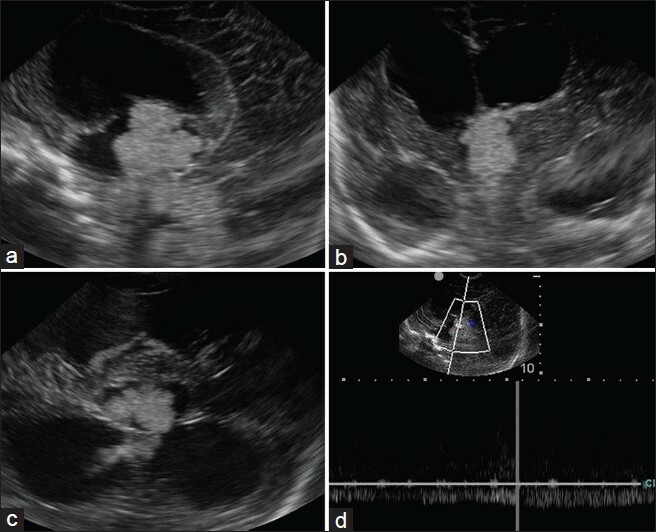 Here, we report a rare case of entirely suprasellar RCC in a 4.5-year-old child causing hypopituitarism, who presented to us with bilateral cryptorchidism. Subsequently we discuss the distinct rarity of entirely suprasellar RCC presenting in this fashion and the relevant literature is also discussed. A 1-year-old girl with craniopharyngioma required external drainage of 40-50 mL/h of cerebrospinal fluid (CSF) after biopsy and cyst fenestration. She developed CSF ascites following insertion of a ventriculoperitoneal (VP) shunt and a distended painful gallbladder following ventriculogallbladder shunt insertion. Revision to a ventriculoatrial shunt was required. This is the first time a craniopharyngioma has been reported to cause increased CSF production. The potential mechanisms of CSF overproduction and the difficulties managing the large volume of CSF in a young child are discussed. Intracranial tuberculomas continue to be a serious complication of central nervous system tuberculosis. Multiple central nervous system tuberculoma is commonly associated with human immunodeficiency virus (HIV) infection. 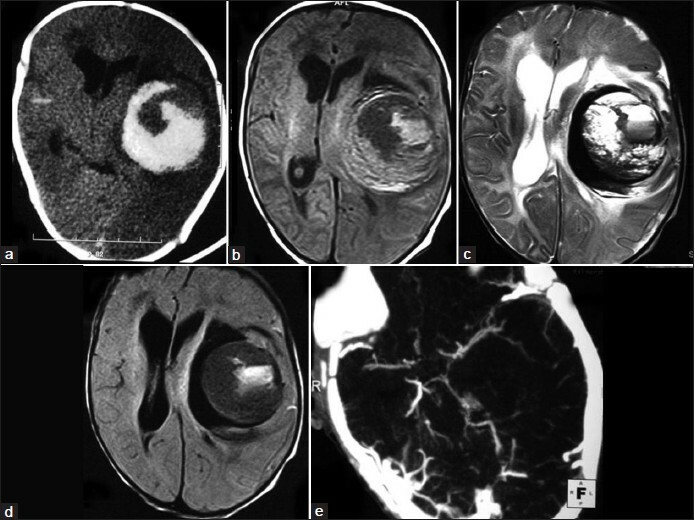 The development of intracranial tuberculomas has been thought to be caused by hematogenous spread of tubercle bacilli on the surface of brain parenchyma from the primary site of infection. 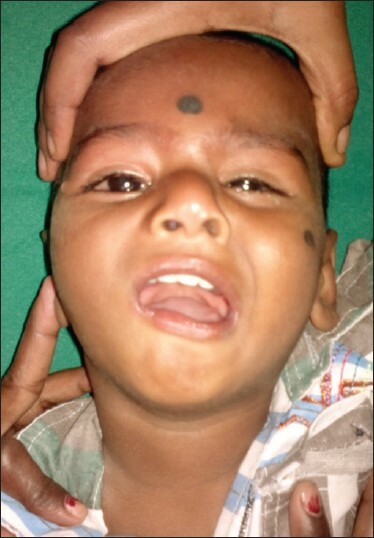 Here, we describe the case of a 5-year-old male child with severe protein energy malnutrition (Marasmus) having large cervical lymphadenopathy and severe nutritional rickets with deformity at presentation. 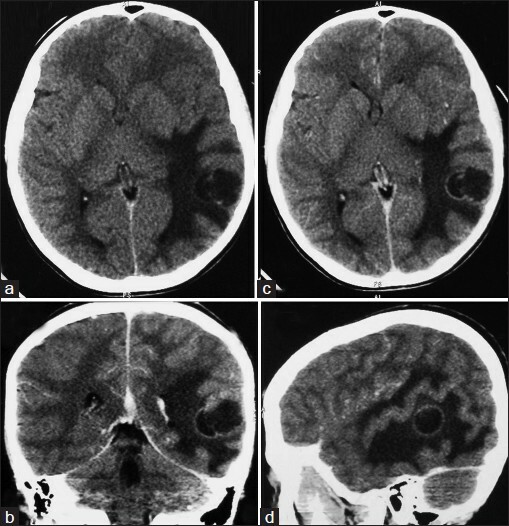 The child developed convulsions 20 days after initiation of antituberculous drugs, and neuroimaging confirmed multiple miliary tuberculomas of brain as primary etiology for the convulsions. 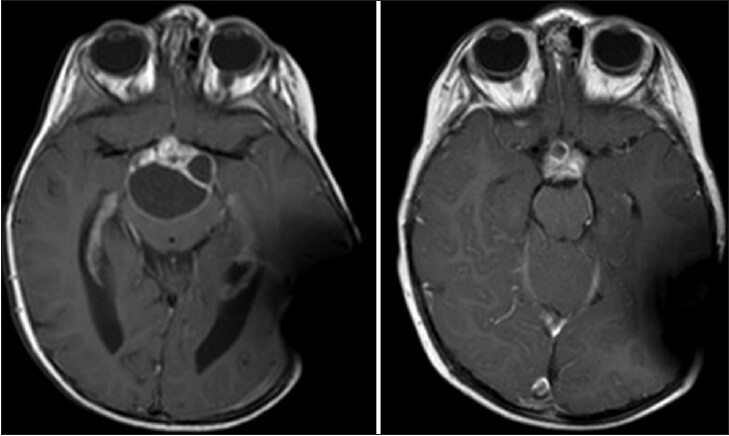 Pilomyxoid astrocytomas is an uncommon aggressive piloid neoplasm, closely related to pilocytic astrocytomas and typically presents in the very young but can occur in older children and rarely in adults. 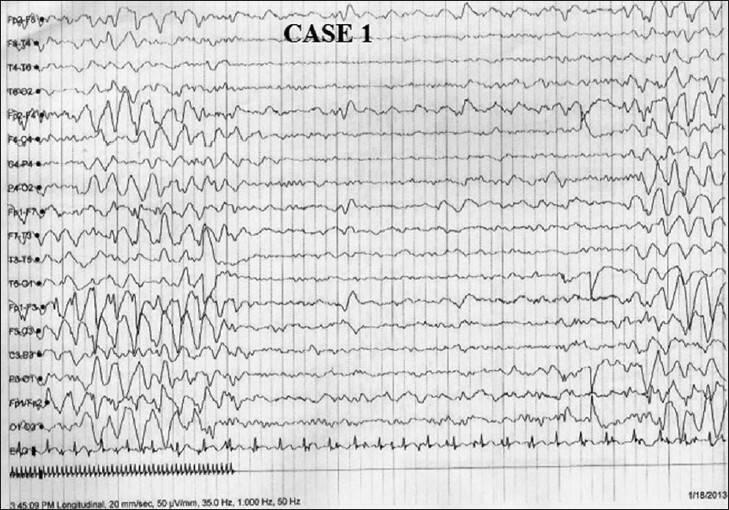 A 12-years-old male presented with focal seizures, headache and vomiting of 10 days duration. 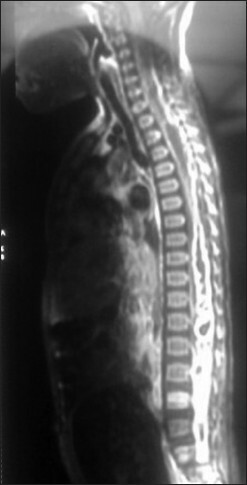 Computed tomogram showed a hypo- to hyperdense and peripherally enhancing, solid-cystic lesion in the left temporal lobe. Histopathological examination revealed a characteristic tumor composed of bipolar cells arranged in dyscohesive sheets, angiocentric pattern in a loose myxoid background, with brisk mitotic activity and foci of necrosis. No Rosenthal fibers or eosinophilic granular bodies were seen. The tumor cells showed strong GFAP and scattered p53 positivity, but were negative for EMA. Ki-67 positivity ranged from 30 to 40%, highest reported till date. The patient was treated with radiotherapy and concurrent temozolamide and the tumor recurred after two years.